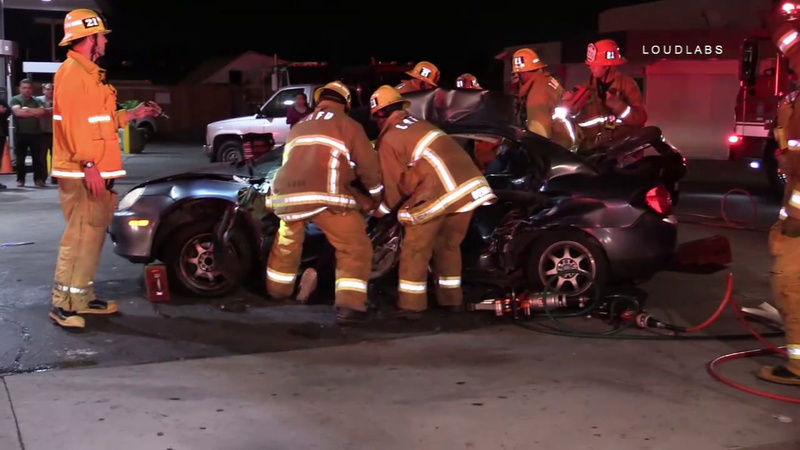 VERNON, Calif. (KABC) -- Six people were hospitalized, five of them in critical condition, after a violent two-car crash Thursday morning at an intersection in Vernon, authorities said. The collision happened about 1 a.m. when one vehicle ran a red light at Vernon Avenue and Alameda Street and broadsided the other car, said a spokesperson for the Los Angeles Police Department's Central Traffic Division. Five people were in the first vehicle, which was traveling westbound on Vernon, the LAPD said. The second car, headed northbound on Alameda, was occupied only by the driver. Using the Jaws of Life, firefighters removed the roof of one car as they extracted its five occupants. The LAPD said neither drugs nor alcohol were a factor in the incident.